The New York Museum Guide iPod Touch, iPhone, and iPad app makes planning a trip to museums in New York City a breeze. The New York Museum Guide iPhone app has well-designed interface, sharp graphics, and smart organization tools. Not only does it help you locate and learn about the larger, well-known museums like the Met, Museum of Modern Art, and American Museum of Natural History, but it also helps you discover hidden gems throughout the five boroughs like Brooklyn Botanic Gardens, Museum of Art and Design, and National Jazz Museum. 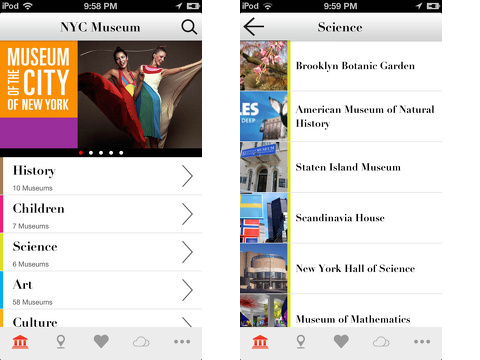 The New York Museum Guide iPhone app can be used with or without location services activated. Basically, I would recommend leaving location services disabled when in New York City, as those unfamiliar with navigating Manhattan will burn through their battery with the Google Maps iPhone app and the Hopstop iPhone app. If you choose to leave location services activated, then you will be able to use the interactive map accessed by touching the location icon at the bottom of the screen. I found the New York Museum Guide iPhone app’s map particularly helpful to plan which museums I could hit in one area. 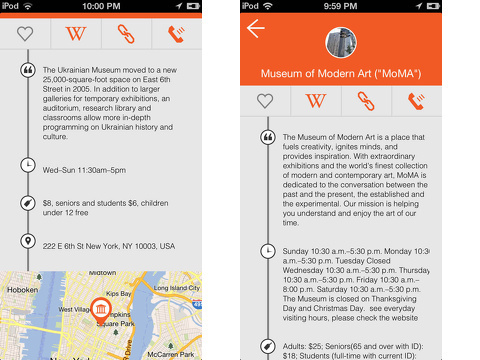 The New York Museum Guide iPhone app has modern orange and gray graphics to frame the interface. The home screen contains a simple list of categories with featured museums’ photographs at the top of the feed. You can scroll with horizontal swipes through the five featured museums. The categories are design, culture, science, children, history, nature, and art. With a touch on a category, you are transported to a new screen with the list of museums and a thumbnail image. The thumbnail images are a great resource to help you spot a museum that may not be marked well. When you touch a museum, a fantastic, concise description and appropriate links are displayed. The name of the museum and photo are housed in a striking orange band at the top of the screen. Just below, you will find chances to favorite the museum, access the Wikipedia article, open the museum’s website, and call with a touch. A fantastic list of details fills the next section of the screen including the hours, admission prices, and location. Finally, at the bottom of the screen, you can touch the map to get a detailed view of the area. As you select favorites, you can access the list with one touch from the home screen on the heart icon. The New York Museum Guide iPhone app is an excellent choice to help you locate museums you want to see and discover those you never knew you would want to see. And, unlike most things in New York City, it’s free. AppSafari review of New York Museum Guide was written by Jenni Ward on July 10th, 2013 and categorized under App Store, Art, Free, iPad apps, Productivity, Reference, Travel, Universal. Page viewed 3687 times, 1 so far today. Need help on using these apps? Please read the Help Page.